Have you experienced financial difficulties to the point of not being able to make payments on your mortgage? These things happen, and while they are less than ideal, there are always solutions. Often times you will be given a grace period to try and sort through your payments. If this doesn’t work, a short-sale will probably be your next option. Foreclosure will most likely be one of your last options- read on to learn what a foreclosure is and how it works. A foreclosure is the process by which a homeowner’s property rights are forfeited as a result of failing to pay the balance on a mortgage loan. A foreclosure is generally a last resort whose need arises when you are unable to short sell your house or pay the outstanding debt through any other means. Normally, it will be sold through a foreclosure auction. In case a sale isn’t made through the auction, the ownership of the home reverts to the lender. When taking out a mortgage, the borrower signs a deed of trust that puts a lien on the acquired property. This makes the loan secured, so ownership can legally revert to the lender in case the borrower fails to make payments on the property on time. If a lender does not ask for any collateral, then this becomes an unsecured loan. The lender of an unsecured loan can take you to court in case of default but he cannot forcefully collect any money from you. Most lenders prefer a secured loan because if you default on the payments, the lender can seize your property and recover the balance owed. It is always expected that you make payments on time. However, the lender, in most cases, will allow a 10-day grace period. If you don’t make the payment after these 10 days then the lender will issue you with a notice of a missed payment. This notice asks you to send the payment ASAP to avoid legal action. If you happen to send the payment to the lender after issuance of this notice, then you may only suffer a penalty and negative feedback on your credit report. If you fail to make a payment for a period of more than 30 days, the lender will issue you with a notice of default. This is a silent way of telling you to pay up or a different action will follow. The notice of default includes information about the property, your name, the amount that you owe the lender, the number of days that have passed since the payment was due and a detailed statement outlining the terms and conditions of the mortgage that you signed with reference to payment timelines. Depending on the terms of the lender, the notice of default may explain that further measures will be taken if an action is not taken by the borrower. While some notices of default are friendly, others can be quite harsh. The most common action after a notice of default is a foreclosure. A foreclosure notice follows if you don’t respond to the notice of default in a manner that convinces the lender you will pay. The foreclosure notice tells you that the bank is on the verge of initiating foreclosure proceedings. Depending on your location, you have 30-120 days to work a deal with the lender through a short sale. If the borrower pays off the balance on the mortgage then the foreclosure is dismissed. However, foreclosure commences if you fail to make the payments. The notice includes the amount due, the interest rate, the name of the lender and the contact information of the lender’s attorney. When the default has not been remedied at the end of the set timeline, the lender will proceed to sell your property through a foreclosure auction or a trustee sale. The auction can take place at the county courthouse, at a convention center, at the office of the trustee or at the scene of the property itself. The property is sold to the highest bidder at the fall of the hammer. Since many people don’t manage to pay cash on the spot, the bank and the highest bidder may enter a deed of lieu for foreclosure. In other cases, the lender may buy the property back. If the auction is not successful then the ownership of the property reverts back to the lender. This is referred to as real estate owned or bank-owned property. Such properties can be sold either through a local real estate agent or in the open market. Other lenders may prefer to sell their property at liquidation auctions, convention centers, or in auction houses. 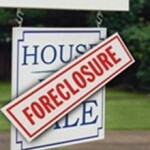 A foreclosure is a last-resort option only when all other of the other options have failed. It has the disadvantage of hurting your credit score for a period of at least 7 years and will make it difficult to deal with future mortgage loans. Be sure to exercise all of your options before resorting to a foreclosure. If you do end up with a foreclosure, stay positive as there is always light at the end of a tunnel. Your credit will eventually bounce back and you will be able to learn from the past and move ahead. Here are some other resources that may help you in periods during and after financial issues: Top 6 Mortgage Lenders for Borrowers with Bad Credit, Improve Your FICO Credit Score, and Top 10 Steps for Getting a Post-Bankruptcy Loan.